Like a little mystery in your purchase? Need a lot of buttons but don't care what's on them? These little 1" buttons are great for decorating everything from backpacks to cosplays! I only have a limited stock remaining, so if you're unsure if the design is in stock, send me a message. PLEASE NOTE THAT YOU ARE RECEIVING A RANDOM ASSORTMENT OF BUTTONS. You are free to suggest what fandoms you like while purchasing, but you are taking a risk at receiving other fandom buttons as well. Alternatively, if you really hate a certain fandom, let me know and I'll avoid it. 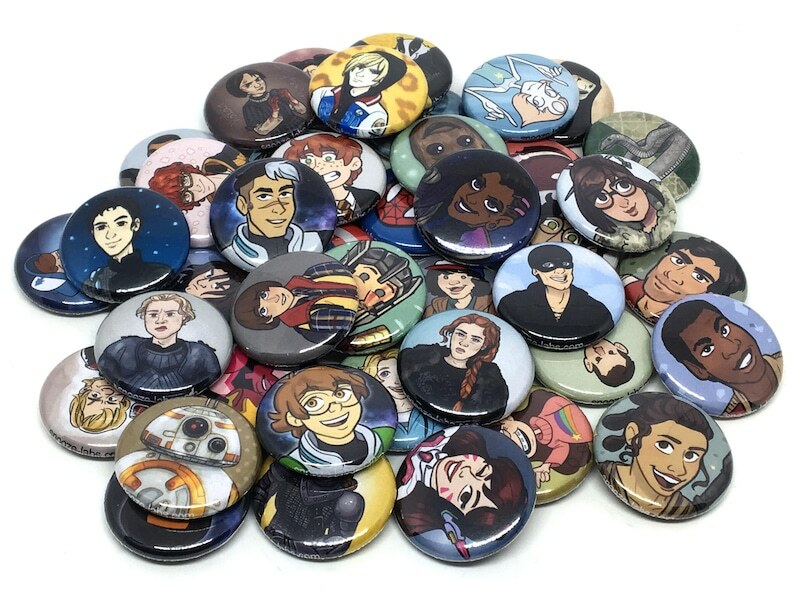 From Avengers to Game of Thrones, Adventure Time to Sherlock, Supernatural to Pokemon, Sleepy Hollow and Teenage Mutant Ninja Turtles, these convention leftover buttons strike a wide variety of audiences! They make great gifts for others or for yourself, ;D.
Tons of buttons. Keeping half of them and gifting the others. I bought a pack of 5 buttons and received six in a little plastic baggy along with a card for 10% off my next order, if I so choose to order again. The buttons themselves are cute, but small, and not what I was expecting. These were so adorable! I was very impressed by the shipping time on the order. The shop actually read my note and I was able to receive most of the items I requested!!! Was very surprised and happy with the amount and variety of buttons I got with this! All great quality and lovely art.